Who Let The Dogs Out, Who? There is talk of a law coming in UK Wide, which is already (I believe) in force in Wales, where dogs must be properly secured within the motor vehicle. This law will not only apply to dogs but to any and all animals, which must be safely secured for every journey. Obviously there will be some leeway for emergencies, and mistakes but I wouldn’t expect too much leeway. Rules 57 of the Official Highway Code states: “When in a vehicle, make sure dogs or other animals are suitably restrained so they cannot distract you while you are driving, or injure you, or themselves if you stop suddenly (aka Crash)”. Having unrestrained pets in a vehicle is putting drivers at risk of being distracted. There is no official penalty (at this point) for this offence within the Highway Code or Law of the Land, should you be pulled up (currently) or cause an accident you would be charged with “Driving without due care and attention”. This comes with Nine (9) Penalty Points and up to £2,500 Fine, and should it be an extreme or serious breach, you could be forced into a compulsory ban, and forced to get an extended re-test of both theory and practical test no matter how long you’ve been driving. If you haven’t already been subject to the New Drivers Act (2 year probation period) you would then become subject to that for a further 2 years. This would put you a new driver with 9 points on your provisional, once you pass, it would only take 3 points to put you up to 12 points and another ban for 3-6 months. You would then need to do another re-rest. It would be a horrible situation to be in. Even if you wasn’t banned, 9 points would put you 1 offence away form a ban, or if you already had a speeding/red light/mobile phone offence it would result in a ban too. This isn’t even the worst of it, if you cause an accident or are in an accident which is caused by an unrestrained or unsecured animal / pet, the odds are very high your insurance could refuse to pay out. 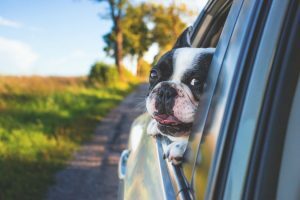 There are some basic guide lines for when travelling with pets or animals within a vehicle. 1, Don’t allow your pet to ride with its head hanging out the window, its potentially dangerous and cause injury. 2, Ideally keep your pet in the rear of the vehicle with a barrier net. 3, Always carry a large bottle of water (5 litres, £1 from most supermarkets) in case your pet overheats and needs to be rapidly cooled down in an emergency. 4, Keep a water bowl and water available for your pet. 5, Use Sun Shades on the windows when its warm/hot, and the sun is bright. 6, Never leave a pet in a hot car. 7, Don’t feed your pet within a few hours of travelling to avoid car sickness. 8, Pack your pets favourite toys, or blankets to give your pet a sense of familiarity. 9, Consider carrying a pet first aid kit for emergencies. 10, Never drive with the Pet on your knee or the drivers side of the vehicle. Dog out of Car Window image by freestocks.org.